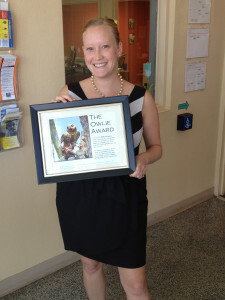 Peter Norback, of One Can a Week, presented Try Freedom Stories with an “Owlie” award. Peter created the award as a thank you a commemoration of the One Can a Week video, produced by Try Freedom Stories and Molly Thrasher, for reaching 1,000 views on YouTube. Let’s get another 1,000 views and see what award Peter can come up with for that occasion! Watch the One Can a Week Video.